Sri Lanka’s Parliament debated the Right to Information (RTI) bill for two days (23 – 24 June 2016) before adopting it into law. No member opposed it, although some amendments were done during the debate. If that sounds like an easy passage, it was preceded by over two decades of advocacy with various false starts and setbacks. A large number of Lankans and a few supportive foreigners share the credit for Sri Lanka becoming the 108th country in the world to have its own RTI (or freedom of information) law. How we reached this point is a case study of campaigning for policy change and law reform in a developing country with an imperfect democracy. The journey deserves greater documentation and analysis, but here I want to look at the key strategies, promoters and enablers. The story began with the change of government in Parliamentary elections of August 1994. The newly elected People’s Alliance (PA) government formulated a media policy that included a commitment to people’s right to know. But the first clear articulation of RTI came in May 1996, from an expert committee appointed by the media minister to advise on reforming laws affecting media freedom and freedom of expression. The committee, headed by eminent lawyer R K W Goonesekere (and thus known as the Goonesekere Committee) recommended many reforms – including a constitutional guarantee of RTI. Sadly, that government soon lost its zeal for reforms, but some ideas in that report caught on. Chief among them was RTI, which soon attracted the advocacy of some journalists, academics and lawyers. And even a few progressive politicians. Different players approached the RTI advocacy challenge in their own ways — there was no single campaign or coordinated action. Some spread the idea through media and civil society networks, inspiring the ‘demand side’ of RTI. Others lobbied legislators and helped draft laws — hoping to trigger the ‘supply side’. A few public intellectuals helpfully cheered from the sidelines. Typical policy development in Sri Lanka is neither consultative nor transparent. In such a setting, all that RTI promoters could do was to keep raising it at every available opportunity, so it slowly gathered momentum. That almost happened in 2002-3, when a collaboratively drafted RTI law received Cabinet approval. But an expedient President dissolved Parliament prematurely, and the pro-RTI government did not win the ensuing election. His unexpected election defeat in January 2015 finally paved the way for RTI, which was an election pledge of the common opposition. Four months later, the new government added RTI to the Constitution’s fundamental rights. The new RTI Act now creates a mechanism for citizens to exercise that right. Meanwhile, there is a convergence of related ideas like open government (Sri Lanka became first South Asian country to join Open Government Partnership in 2015) and open data – the proactive disclosure of public data in digital formats. These new advocacy fronts can learn from how a few dozen public spirited individuals kept the RTI flames alive, sometimes through bleak periods. Some pioneers did not live to see their aspiration become reality. Our RTI challenges are far from over. We now face the daunting task of implementing the new law. RTI calls for a complete reorientation of government. Proper implementation requires political will, administrative support and sufficient funds. We also need vigilance by civil society and the media to guard against the whole process becoming mired in too much red tape. RTI is a continuing journey. We have just passed a key milestone. 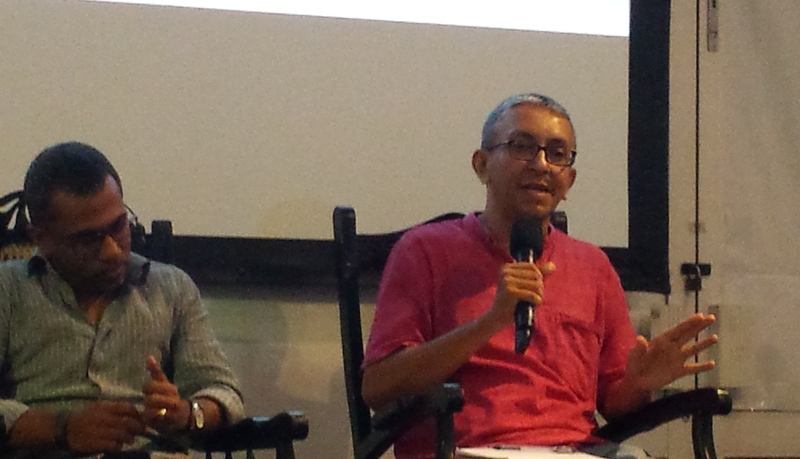 Science writer and columnist Nalaka Gunawardene has long chronicled Sri Lanka’s information society and media development issues. He tweets at @NalakaG. 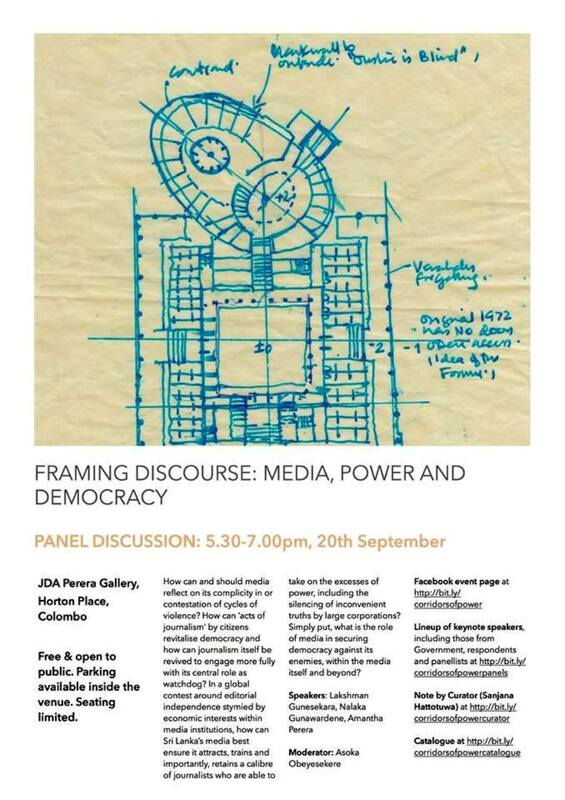 I just spoke on a panel on “Framing discourse: Media, Power and Democracy” which was part of the public exhibition in Colombo called Corridors of power: Drawing and modelling Sri Lanka’s tryst with democracy. The architecture of the mainstream media, and increasingly, social media (even though distinct divisions between the two are increasingly blurred) to varying degrees reflects or contests the timbre of governance and the nature of government. How can ‘acts of journalism’ by citizens revitalise democracy and how can journalism itself be revived to engage more fully with its central role as watchdog? 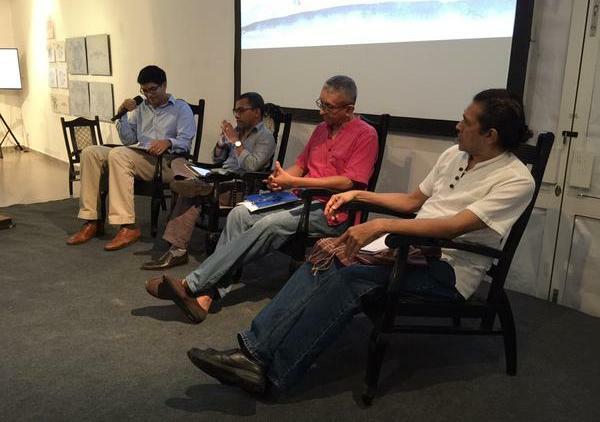 In a global contest around editorial independence stymied by economic interests within media institutions, how can Sri Lanka’s media best ensure it attracts, trains and importantly, retains a calibre of journalists who are able to take on the excesses of power, including the silencing of inconvenient truths by large corporations? 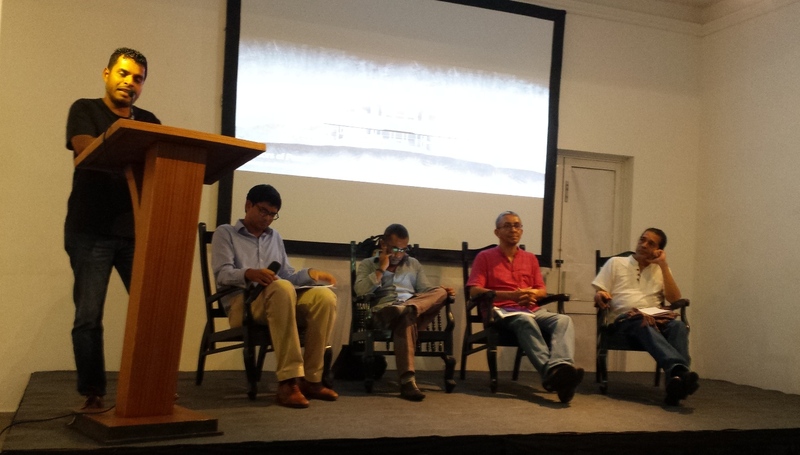 The panel, moderated by lawyer and political scientist Asoka Obeyesekere comprised freelance journalist Amantha Perera, Sunday Observer editor Lakshman Gunasekera, and myself. Here are my opening remarks (including some remarks made during Q&A). Curator Sanjana has asked us to reflect on a key question: What is the role of media in securing democracy against its enemies, within the media itself and beyond? Public Trust Deficit in politicians and public institutions – not as widely recognised, but is just as pervasive and should be worrying us all. Media Deficit, probably the least recognised deficit of all. This has nothing to do with media’s penetration or outreach. Rather, it concerns how our established (or mainstream) MEDIA FALLS SHORT IN PERFORMING the responsibilities of watchdog, public platform and the responsibility to “comfort the afflicted and afflict the comfortable”. In this context, can new media – citizens leveraging the web, mobile devices and the social media platforms – bridge this deficit? My answer is both: YES and NO! All these trends are set to grow and involve more and more citizens in the coming years. Right now, one in four Lankans uses the web, mostly thru mobile devices. BUT CAN IT REPLACE THE MAINSTREAM MEDIA? NO, not in the near term. For now, these counter-media efforts are not sufficient by themselves to bridge the three deficits I have listed above. The mainstream media’s products have far more outreach and and the institutions, far more resources. Also, the rise of citizen-driven new media does NOT – and should NOT — allow mainstream media to abdicate its social responsibilities. This is why we urgently need MEDIA SECTOR REFORMS in Sri Lanka – to enhance editorial independence AND professionalism. The debate is no longer about who is better – Mainstream media (MSM) or citizen driven civic media. To me, what really matters are the ACTS OF JOURNALISM – whether they are RANDOM acts or DELIBERATE acts of journalism. Let me end by drawing on my own experience. Trained and experienced in mainstream print and broadcast media, I took to web-based social media 8 years ago when I started blogging (for fun). I started tweeting five years ago, and am about to cross 5,000 followers. It’s been an interesting journey – and nowhere near finished yet. Is Death Penalty the right response to rise of brutal murders? Can our media be more restrained and balanced in covering sexual crimes involving minors? What kind of Smart Cities or MegaCity do we really need? How to hold CocaCola LK responsible for polluting Kelani waters? Yes, many of these are fleeting and incomplete conversations. So what? And also, there’s a lot of noise in social media: it’s what I call the Global Cacophony. BUT these conversations and cross-talk often enrich my own understanding — and hopefully help other participants too. Self-promotional as this might sound, how many Newspaper Editors in Sri Lanka can claim to have as many public conversations as I am having using social media?